SugarSpiceStyle: A Tarina T Rainbow! Not only has Tarina Tarantino created an entire jewelry collection featuring some of the beloved--and hated--characters of the Wizard of Oz, she has produced a poster-size book with a uniquely Tarina T take on the infamous tale. 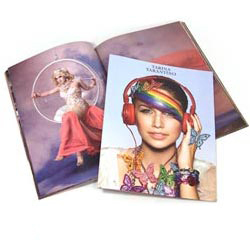 Measuring 9.5 x 12.4 inches, "My Pretty" Collection Book is sure to be 52 pages of creative and colorful fun. All we need now is TT to design a pair of ruby slippers!